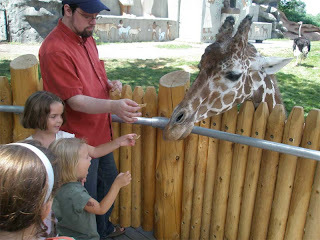 My sister-in-law is a zookeeper at the Detroit zoo, so today my nieces came over and we all went to the zoo. 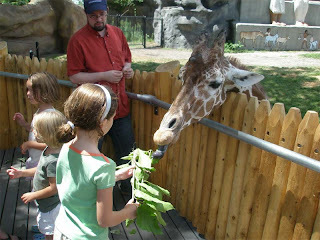 Ashley (the super-zookeeper that she is) was able to get us a private feeding on the giraffe feeding platform. It was very cool to be able to spend a lot of time feeding them slowly and not feeling rushed because of the 90 people behind you. We were able to feed them the typical 'cracker' they let you feed them with at the normal feed, but also we got to give them branches with leaves. It was very cool to watch that long purple/black tounge come out and twist and wrap itself around the branch to pull all the leaves off as it pulled it back into its mouth. The Nieces certainly liked watching that up close too. Later Ashley (the zookeeping sis-in-law) took us to the hippo exhibit where she was going to feed them. That was a funny sight because she was in civilian lothes, so the other park visitors first wondered why a woman would be walking arround the zoo with an arm full of produce and then, why she would be tossing it into the hippo pond. The hippo was fun to watch. Huge fleshy mouth opening to accept a cantalope or lettuce head and then submerge it's whole body underwater to chomp on it. 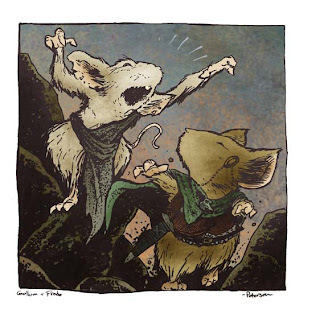 Once I was home it was time to do some Mouse Guard work. Today was coloring and so as a warm up, I added some digital pigment to one of my sketches. Sam and Frodo sparring, but I offerd that Sam and Frodo wouldn't have much use for sparring (although I guess they did now that I think about it...only with Aragorn...).